Baseball Hall Of Fame Voters Pick 'None Of The Above' For 2013 : The Two-Way The Baseball Writers' Association of America's ballot for this year listed 37 players. None of them will be going to the Hall of Fame this year, despite a class of candidates that included Roger Clemens and Barry Bonds. Craig Biggio led the voting. 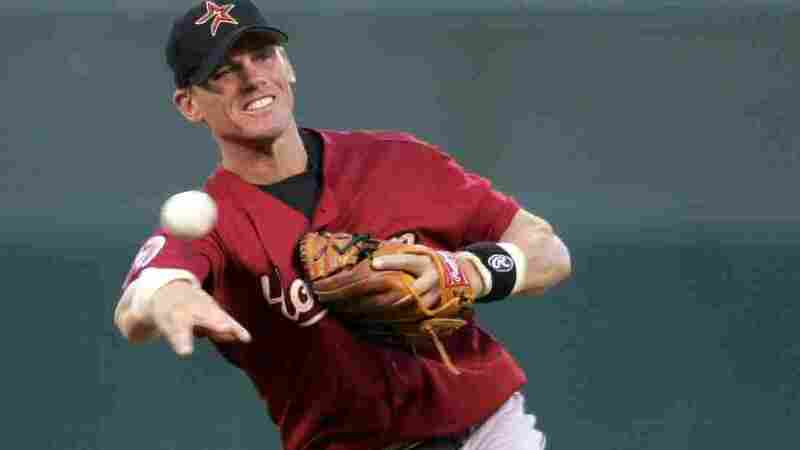 Craig Biggio of the Houston Astros led the 2013 Hall of Fame voting, but fell short of the 75 percent required for induction in Cooperstown. No players were chosen in the balloting. The Baseball Hall of Fame's Class of 2013 will not have any new inductees from the ranks of the recently retired, despite a list of candidates that includes Roger Clemens and Barry Bonds. Those players, whose careers left their names at or near the top in the record books in multiple categories, are suffering from the lingering stigma of steroid use. It is only the second time since 1971 that no players were sent to Cooperstown. A press release from the Hall of Fame, which announced the results today at 2 p.m. ET, called it "a shutout." The Baseball Writers' Association of America's ballot for this year's Hall of Fame class listed 37 players, including 24 new candidates. To be inducted, a player must receive a vote on at least 75 percent of the ballots returned. The organization says 569 ballots were cast this year — the third-highest total in its history. It was not Clemens but another former Houston Astro, Craig Biggio, who led the voting with 68.2 percent, followed by pitcher Jack Morris (67.7 percent) and another Astro, Jeff Bagwell (59.6 percent). Former catcher Mike Piazza won 57.8 percent of the vote. A second baseman, Biggio twice led the National League in runs scored. Biggio had 3,060 hits, surpassing a benchmark that usually locks in a Hall of Fame spot. He hit 291 home runs over the course of his 20-year career, which he spent entirely with Houston. A seven-time All Star, Biggio was often noted for being a gritty player who proved to be both durable and loyal. He thrived after being forced to change positions — from catcher to second base, and then the outfield — and he famously passed on a chance to test the free-agent market so that he could remain with the Astros. Former Atlanta Brave Dale Murphy didn't receive enough support in his fifteenth and final year of eligibility, getting 18.6 percent of the vote. The only names that will be added to the Hall of Fame ranks are historic choices made by the Hall's Pre-Integration Committee – umpire Hank O'Day, New York Yankees owner Jacob Ruppert and 19th-century player Deacon White. Neither Roger Clemens nor Barry Bonds received more than 38 percent of the votes cast, with Clemens netting 37.6 percent and Bonds 36.2 percent. Bonds, a three-time Major League most valuable player, was renowned for his rare blend of speed and power before accusations of steroid use tainted his statistics. In 2001, he hit a National League-leading 73 home runs — the only time in his career that he hit more than 50 of them. Clemens split his career among the Boston Red Sox, Toronto Blue Jays, New York Yankees and Houston Astros; he was named the league's best pitcher at each of them, as between 1986 and 2004, he won the Cy Young Award seven times. Clemens pitched more than 200 innings in 15 different seasons, throwing 46 shutout games along the way. But both of those big names — along with slugger Sammy Sosa, who attracted only 12.5 percent of the vote — are suffering from their association with baseball's era of steroid use.